The click on part (yellow)of the handle inside the robot is broken on one side and makes the handle loose. How can I buy and easily replace that part ? 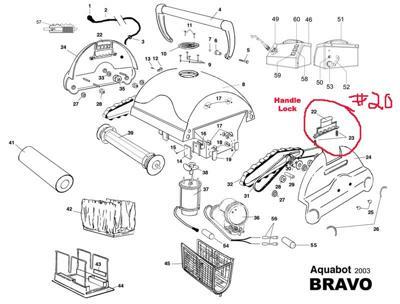 The image above is their parts diagram, however the handle lock appears to be incorrectly labeled. It is #20 on the parts order list. The side plate should come off with several screws. Let me know if you have a problem.